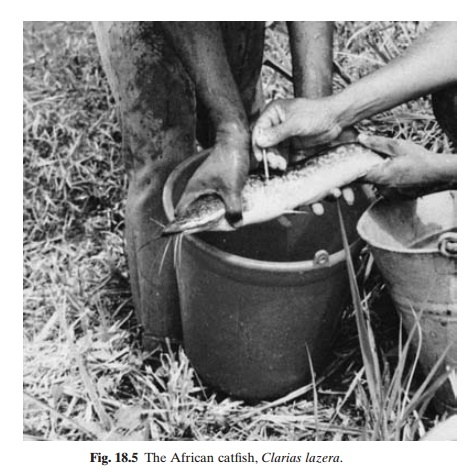 Clarias lazera (= gariepinus), known as theAfrican catfish, sharp tooth catfish or Nile catfish . Clarias lazera (= gariepinus), known as theAfrican catfish, sharp tooth catfish or Nile catfish (fig. 18.5), is a recent addition to aquaculture in Africa, which has been largely dominated by tilapia. Though its potential for farming has been demonstrated, its culture presently seems to be restricted to the Central African countries, Ivory Coast and, on an experimental scale, Egypt. Other catfish, such as Chrysicthys spp., are also being experi-mented with for pond and cage culture. Clarias lazera can best be described as anomnivore, often feeding on vegetable matter, aquatic invertebrates, small fish, detritus, etc. Though it normally survives on dissolved oxygen, it comes to the surface and breathes atmospheric air when the oxygen concentration of water becomes low. The fish have been observed to reach over 130cm in length and 12.8kg in weight. A high degree of hardiness, the ability to feed on a variety of feedstuffs, and good growth and survival in poorly oxygenated waters have made it an attractive fish for rural aquaculture. The species can grow in brackish water in salinities of 10ppt and survive in salinities up to 29ppt. The most common system of culture for this catfish is in pond farms, either in monoculture or in combination with tilapia, which has been shown to be a compatible species under pond conditions. Experiments have shown that the species is highly suitable for high-density tank culture (Hogendoorn et al., 1983), but such systems have not yet been adopted on a commercial scale. Clarias lazera are reported to become matureunder natural conditions at the size of about 32cm (two or three years old) and spawn in the flooded rivers. Under pond conditions they mature in about seven months, when they have attained a weight of 200–300g. The spawning season varies between regions. In Egypt and Central Africa it is between July and September and in West Africa in April and May. They seem to spawn only once with the onset of the rainy season, under natural conditions, but can be bred throughout the year in captivity. Observations confirm that spawning is stimulated by floods or increased levels of water in ponds due to rain or exchange with fresh water, as in the case of C. batrachus. Eggs are ejected in several batches (15–50 batches) during the extended mating and spawning, at temperatures above 17°C.The eggs adhere to sedges and grass. While it is fairly easy to spawn mature fish in ponds by simulating changes in water levels, as happens during floods in nature (by draining the ponds partly and filling them suddenly with fresh water), the survival of offspring is generally very poor. Unlike some of the other catfish, C. lazera does not seem to show any parentalcare, and under pond conditions the larvae and fry seem to become cannibalistic. Additionally, there is a fair amount of predation by frogs and other aquatic animals in ponds. Because of these limitations, methods of induced spawning are adopted for the production of fry. For induced spawning, brood stock from natural habitats or culture ponds can be used. Ripe females in captivity range in size from 28–65cm, weighing 175–1600g. Females can be identified by the rounded vent with a longitudinal cleft, and the males by the elongated urogenital papilla. From experimental studies it is concluded that the best means of stimulating ovulation in females is by injection of the hormone product desoxycorticosterone (DOCA). The suggested dose is a single intraperitoneal injection of 5mg DOCA per 100g weight of fish. Injected females and mature males (which may not require any injection) are kept in separate tanks for about 10 hours, after which they are placed together in a tank or cement cistern, usually in the evening. Spawning occurs during the night, about 10–16 hours after injection of the female. The eggs can easily be collected in the morning and hatched in separate containers. The main problem with this method is that the couples often inflict fatal injuries on each other. To avoid this, the injected females can be stripped and the eggs fertilized artificially. First the females are injected with the above dose of DOCA, usually in the morning, and the males in the evening. The female is stripped about 10 hours after the injection. Males cannot be hand stripped because of the structural peculiarities of the seminal vesicle. If pressure is exerted on the abdomen, the milt will pass to the dorso-lateral lobes of the vesicle and not to the genital opening. So the males have to be killed and the sperm collected directly from the vesicles. Injection helps to increase the yield of milt three to five times. Embryonic development is completed in about 24 hours after fertilization at temperatures around 26°C. The yolk sac is absorbed in six days and the larvae start feeding when about three days old. Clarias lazera can be spawned by hypophy-sation as well, like many other species (Hogendoorn, 1979). Acetonedried carp pituitary at a dose of 4mg per kg body weight is adequate to ripen females. As mentioned earlier, injection of males does not seem to help in stripping them, and they have to be sacrificed to obtain milt. The females can be stripped 11–16 hours after injection. At 20°C, hatching of fertilized eggs occurs in about 48 hours, when the hatchlings can be transferred from incubators to a trough for rearing. The stocking rate of fry is generally 10000– 20000 per ha. Fed on natural food, they reach a weight of around 10g in about three weeks. Thereafter, the fry start feeding on larvae of aquatic insects. Artificial feeds can be given to the fry at this stage.Though amphibians, aquatic insects and occasionally wild fish prey on the fry, the main reason for low survival in ponds appears to be the lack of appropriate feed. Since most of the research efforts on C. lazera have been directed towards developing methods of spawning and rearing of fry, there are only limited data available on commercial grow-out procedures. In rural fish culture, the fish normally live on the natural productivity of the ponds, which may be enhanced by the addition of small quantities of fertilizers. In recent years, attempts have been made to grow pigs or ducks in association with fish ponds, as pig manure and duck droppings add considerably to the productivity of the ponds. In Central African countries, the fish have been reared in ponds heavily fertilized with pig manure and fed on different locally available feedstuffs. Brewery waste and peanut cake areused as the main supplementary feed in some centres. Table 18.1 shows the composition of a diet used to determine the growth rate of fingerlings (9g weight), stocked at densities in the range 1–10 per m2 (Richter, 1976). The results showed that growth and feed conversion with pelleted feeds containing vegetable products were very satisfactory at stocking densities of two fish per m2. The fish grew to an average weight of 600g in about 200 days. The estimated production was in excess of 12 tons/ha per year. It has been found that the African catfish seldom make use of demand feeders, and hand feeding is the most practical feeding method. It has also been observed that the males grow much faster than females. De Kimpe and Micha (1974) found that in four months’ rearing, the males attained a weight of 427g, while the females reached a mean weight of only 292g. In integrated farming with pigs, catfish of 95g mean weight, stocked at the rate of one fish per m2, grew to over 380g in 4.5 months’ rearing, giving an annual yield of 7 tons/ha. While the high potential of C. lazera (= gariepinus) has been demonstrated both in pond culture and in intensive tank culture, recirculation systems have been found to be more effective than flow-through systems for intensive culture, owing to the tolerance of the species to the high ambient temperature and high stocking density (Bovendeuret al., 1987; Huisman and Richter, 1987). Although a number of parasites have been identified from C. lazera, mortality due to major infections has not been reported. Trichodina infestation of fry has been observed in ponds and this can be controlled by treatment with 50ppm formalin for about an hour.